Artists — and that’s you! 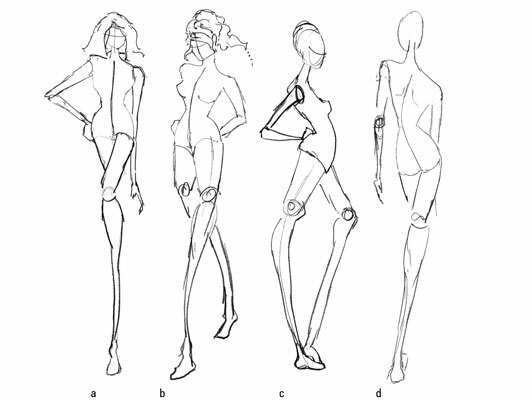 — often consider the front view the easiest to draw. Imagine looking straight on at a person or at yourself in the mirror — that’s a front view. The front view allows you to see a complete view of both sides of the body, keeping the imaginary center front line exactly down the middle. With the three-quarter view, the head can face any direction; play with various directions for different looks and feelings. Drawing the three-quarter view is a bit advanced, but that makes it all the more fun to explore, so don’t let it scare you! You may not see or use the side view as much as the other views, but it’s great for showing the side details of a dress or the way a coat nips in at the back waist. The side view is also a high fashion and creative way to show a wedding dress or evening gown. Capturing the side view can be tricky, but with a little practice, your side views will have just as much attitude as your rockin’ front views.